Each year for years I have made myself a large personal knife to go test to the max. I mark them each year that says, My knife and the year. I sell them each year then make another. Beginning last year I made my wife, Bob, a personal knife to go use and learn how to cut with. This is her first personal knife. It is engraved on the front of the guard, where I mark my own, . The front of the guard is engraved as is the side of the guard and pins. The engraved banner is not normal for me. I always mark or engrave my name first then the MS stamp. She had me to do the MS on top then the name Fisk. So this is a rare marked piece. She wants this each year and being a smart husband I do what she says. If you want something rare this is it. It did cut very well. She consistently outcut me all year on water bottles with this knife. Its what I call a mid size knife. Like always with the personal knife I do not touch up the finish, I want folks to see how I grind and what the knife has done. 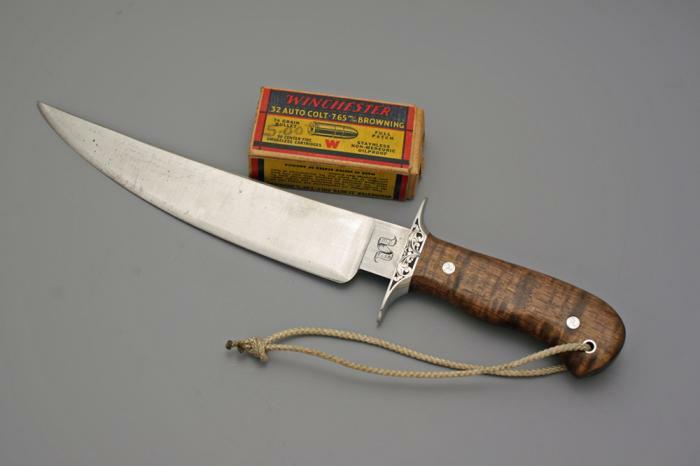 This knife has been in two Knife Rodeos or competitions. It has cleared brush in the wilderness area where we camp and hunt. It went in a Kayak pack and was used to help clean one deer. The knife went to England by the way for cutting demos.